At the beginning this was only a French forum, but now I will post every news about the band here in English (sorry if I do some mistakes) AND in French in the other section. Obviously you can also add news if you know about something. The band have written and recorded a brand new EP 'Sojourn' which will be released at the beginning of next year. The EP marks a departure from their prominent garage/beat sound of their first two records into a more contemporary and alternative direction. Check out new songs 'Nowhere To Run' and 'Finding Out' on the tracks page. More gigs to come soon, watch this space. Video for "Nowhere To Run" coming soon! New German date in November! Warning! Gig in Rochefort is on the 29th, not the 26th like it was previously announced. Unfortunately, "Sojourn" release is postponed to January. New date at the end of November in Germany! but also in a limited edition CD! For those of you who don't want to buy it in Germany, the release is planned for early next year in other countries, notably in UK and France. Otherwise you can order the mp3 version on amazon Germany! That's all for tonight, it's already a lot of news! New video for "Nowhere To Run" online! It's very different from the previous ones. THE 3rd December LEICESTER GIG SEEMS TO BE CANCELLED! Unfortunately it had been removed from both the official site and Myspace. On the contrary, people in Le Havre are lucky: a date had been announced in January. New gigs! The Sojourn EP Tour is on its way! Warning! 26th November gig has been deleted on Myspace! Cancelled? Free gig in The Old Blue Last in London on the 16th of December! Merry Christmas to all of you! Flèche d'or tomorrow! I posted the review in French for the Flèche d'Or gig, photos to come! Merry Christmas! We begin the year with a bad news for people in Heidelberg, this gig is now moved to Weinheim the same day. Tomorrow 26/01 at the Stereowonderland in Cologne, ACOUSTIC gig! Same thing in France (and UK of course) guys please! Despite an audience not really into the show, awesome gig in Le Havre last Friday! Review, setlist and photos to come! Gigs in Italy in March! Gig in London on March, 30th for Sojourn release! 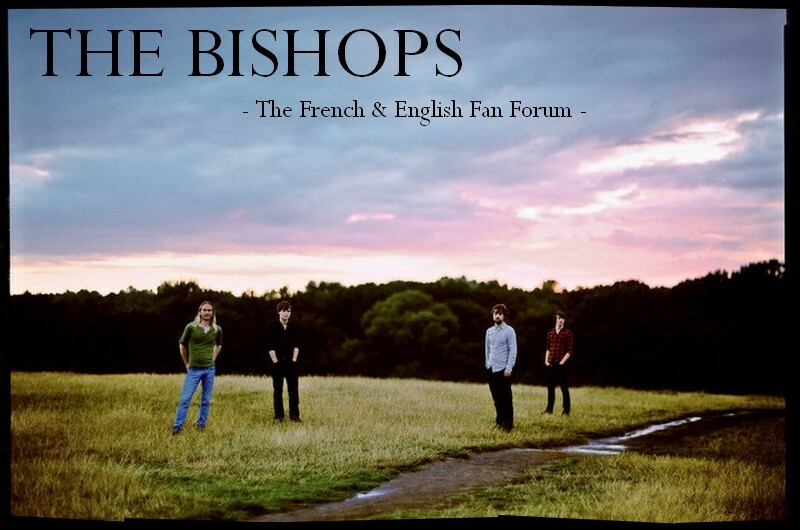 Review of the Magic Mirrors gig in the French (sorry about that) section "Concerts / Le groupe et vous"
The Bishops on Amazing Radio tomorrow Sunday, 20th February at 7 pm (English hour), repeat of the show on Wednesday at 6 pm. Digital release of Sojourn, 21st March in UK, 8th April in France. Gig in Paris on July 1st. Unfortunately, the first two dates of the Italian tour (23rd and 24th of March) are cancelled "due to closure of these venues as a result of new regulations for live music".